Crisis in Syria and Iraq: All-in or all-out? To use the Texas Hold’em poker analogy, Islamic State (ISIS) is ‘all-in’ to seize the major cities on the Syrian-Turkish border as well as swathes of regional areas in western and central Iraq. The actions are clinical, calculated and surprisingly conventional. The approach is one of simple arithmetic and follows an important principle of war – mass, or more plainly ISIS has the numbers. Unlike poker however, the stakes are not casino chips but rather millions of innocent victims caught up in yet another cycle of Middle Eastern violence. While the much-vaunted precision-guided munitions continue to be dropped by U.S.-led coalition aircraft, the unrelenting nature of ISIS ‘boots on the ground’ is the decisive factor. Attrition of its fighters is not a concern. Thousands are ready and better positioned to be ordered into the fray. To coin the phrase, ISIS is currently the side that is the fastest with the mostest and many battles throughout history have been won this way. So, if the tactic is to seize and hold the likes of Kobani or Anbar province on the other front in Iraq, how then might this contribute to the ISIS strategy? 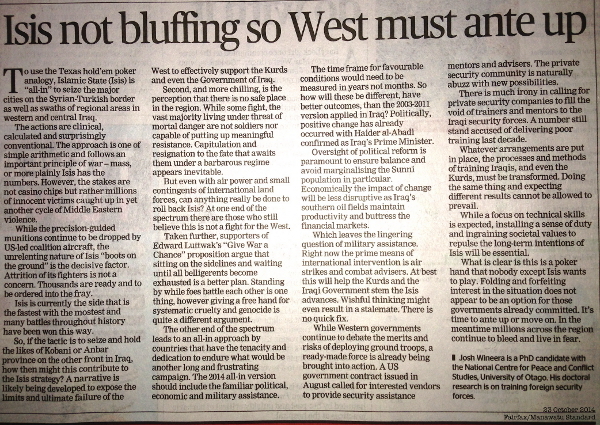 First and foremost a narrative is likely being developed to expose the limits and ultimate failure of the ‘West’ to effectively support the likes of the Kurds and even the Government of Iraq. This is certainly being helped along with media commentators such as Middle East correspondent Patrick Cockburn asserting the ‘U.S. strategy is in tatters as ISIS marches on’. Second, and more chilling, is the perception that there is no safe place in the region to escape the onslaught. While some fight, the vast majority living under threat of mortal danger are not soldiers nor capable of putting up meaningful resistance. Capitulation and being resigned to the fate that awaits them under a barbarous regime appears inevitable. But even with air power and small contingents of international land forces can anything really be done to roll back ISIS? At one end of the spectrum there are those that still believe this is not a fight for the West. Continued intervention is not the answer they decry. Taken further, supporters of Edward Luttwak’s ‘Give War a Chance’ proposition argue that sitting on the sidelines and waiting until all belligerents become exhausted is a better plan. Standing by while foes battle each other is one thing, however giving a free hand for systematic cruelty and genocide is quite a different argument. On this issue, if widespread butchery and carnage is the trigger for international reaction then according to Canadian journalist Neil MacDonald intervention in places like the Democratic Republic of Congo is more warranted.”ISIS’s acolytes are just apprentices at atrocity compared to some in the Congo”. The other end of the spectrum leads to an all-in approach by countries that have the tenacity and dedication to endure what would be another long and frustrating campaign. The 2014 all-in version should include the familiar political, economic and military assistance. The time frame for favourable conditions would need to be measured in years not months. So how will these be different, have better outcomes, than the 2003-2011 version applied in Iraq? Politically, positive change has already occurred with Haider al-Abadi confirmed as Iraq’s Prime Minister. UN Secretary-General Ban Ki-moon welcomed al-Abadi’s formation of a new inclusive Government in Iraq. Oversight of political reform is paramount to ensure balance and avoid marginalising the Sunni population in particular. Economically the impact of change will be less disruptive as Iraq’s southern oil fields maintain productivity and buttress the financial markets. Inter-Governmental Organisations such as the World Bank and International Monetary Fund are not expected to have to significantly intervene. Which leaves the lingering question of military assistance. Right now the prime means of international intervention is air strikes and combat advisors. At best these immediate efforts will help the Kurds and the Iraqi Government stem the ISIS advances. Wishful thinking might even result in a stalemate. There is no quick fix. Pentagon spokesman Rear Admiral John Kirby has said “people need to understand we need a little strategic patience here…it is going to take a bit of time”. While western governments continue to debate the merits and risks of deploying ground troops, a ready-made force is already being brought into action. A U.S. Government contract issued in August called for interested vendors to provide security assistance mentors and advisors. The private security community is naturally abuzz with new possibilities. Eric Prince, founder of controversial security contractor Blackwater, has waded into the conversation. Calling the Iraqi Army inept after billions spent on training and equipping them, Prince suggests, “if the old Blackwater team were together, I have high confidence that a multi-brigade size unit of veteran American contractors or multinational force could be rapidly assembled and deployed to be the necessary ground combat team”. He goes on stating, “a competent professional force of volunteers would serve as the pointy end of the spear and would strengthen friendly but skittish indigenous forces”. 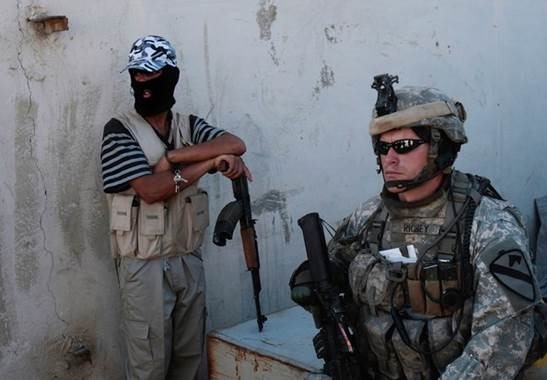 There is much irony in calling for private security companies to fill the void of trainers and mentors to the Iraqi security forces. A number still stand accused of delivering poor training last decade. Whatever arrangements are put in place by international military forces or private security companies, the processes and methods of training Iraqi’s and even the Kurds must be transformed. Doing the same thing and expecting different results cannot be allowed to prevail. While a focus on technical skills is expected, installing a sense of duty and ingraining societal values to repulse the long-term intentions of ISIS will be essential. What is clear is this is a poker hand that nobody except ISIS wants to play. Folding and forfeiting interest in the situation does not appear to be an option for those governments already committed. It’s time to ante up or move on. In the meantime millions across the region continue to bleed and live in fear. 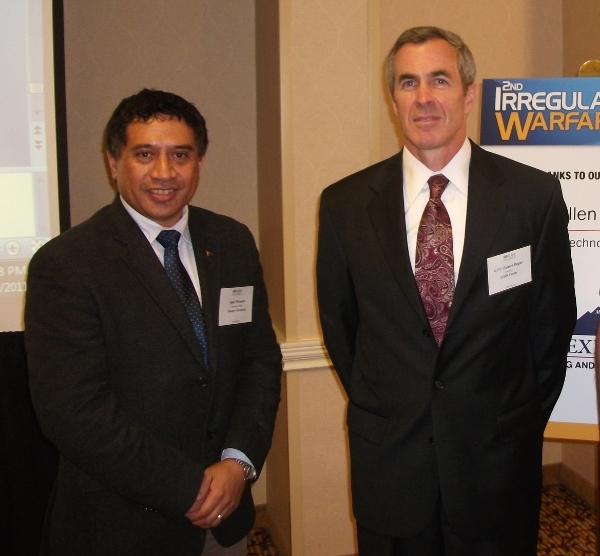 Josh Wineera is a member of the New Zealand National Forum for the Council for Security Cooperation in the Asia Pacific. He is also a PhD candidate with the National Centre for Peace and Conflict Studies at the University of Otago. His doctoral research is on training foreign security forces. After 10 years of fighting two major insurgencies, many western nations can feel comfortable that they have advanced their thinking and practice of counterinsurgency operations. The intellectual and policy effort brought to bear on countering the Iraqi and Afghan insurgencies has been quite staggering, perhaps even greater than the proliferation of deterrence and containment theories promoted during the Cold War. The establishment of new think-tanks in Washington D.C. such as the Center for New American Security, aside more traditional institutions such as the Carnegie Endowment for International Peace, has helped cultivate and revitalise military counterinsurgency strategies and doctrine. The language of counterinsurgency is ubiquitous, to the point that politicians, academics, generals and soldiers can quite easily converse about “protecting the population” and “building the capacity of the host nation”. In the 21st century, counterinsurgency has been codified, systemised and established as ‘must-do training’ for land forces in particular. “Insurgents are bad” and “we must support the weak or fledging host government” is not just a catch-cry but is firmly embedded in the military psyche. But this is not good, not good at all. In becoming proficient, maybe even obsessed with counterinsurgency training, the dangerous assumption is that military forces will only be used to counter insurgents and establish or re-establish a host government’s right to govern. What then if the government or the state elites are actually the problem? That either through corruption, disregard for the international system or most likely an oppressive and brutal approach to its citizenry – surely that type of government, with any preceding military intervention calls for a 180-degree turnaround from countering an insurgency to actively encouraging and supporting an insurgency to remove it. What then if the insurgents are the “good guys” and the government is the “bad guy”? The resurgency of insurgency has been a feature of the Arab Spring. Libya, Egypt and Syria are classic examples of governments being re-characterised as ‘regimes’, with many in the international community willing to encourage insurgents to depose the regime. This of course is nothing new, aiding the weak to vanquish the strong. Military intervention in these cases has been primarily the use of strategic stand-off capabilities, such as attack aircraft, and Special Forces. Provision of weapons to the insurgents, such as lifting of the embargo in Syria, is a case in point of trying to equalise the conflict. So what then of the counterinsurgency training of the general purpose military force? How hard or easy is it to change, or even balance the training to be prepared to support and fight with insurgents to depose recalcitrant governments and their state forces? If in a counterinsurgency sense, working with the fledging security forces of governments we like is hard, how about then in a pro-insurgency sense, the greater difficulties of fighting alongside a less structured and less organised mish-mash of rebels who seek to oust their political leaders? Where is the manual for that, where is the Field Manual FM 3-34 Counterinsurgency for supporting insurgencies? For sure, there are doctrines that relate to associated operations such as guerrilla warfare and subversion. By and large however, these remain the purview of Special Forces. The thought that general purpose forces would re-orientate to irregular warfare, towards counterinsurgency in particular, was considered fanciful prior to 9/11. But look where we are today. There would hardly be a land forces training exercise that doesn’t incorporate some kind of insurgent activity – insurgents equals bad, host government equals good. It is time to consider weighting an equal amount of military thinking and training around intervening and supporting other government forces as well as opposing them and supporting anti-government forces. The intellectual and policy effort has already recognised this. Some governments we like and will support, some governments we don’t and may have to take action to remove them. The pressing challenge for military planners and trainers therefore, is to prepare for both. Josh Wineera lectures on joint, interagency and multinational operations and irregular warfare at the Centre for Defence and Security Studies, Massey University. His research interests include international security, state-building and security sector reform. Training for war is not a precise science. By its very nature war is imprecise and unpredictable. To make matters worse there tends to be an opponent who, in the words of American General George Patton, is trying his hardest to make you die for your country rather than him. Training therefore has to be relevant, intensive and invariably adaptive. War since 9/11 has become increasingly characterised as being irregular in nature. Modern war has become less about the battles between states and their armies and more about defeating violent non-state groups. Terms and descriptions like peacekeeping missions or stability operations are often an attempt to re-categorise what are actually wars. While the term war may sit uncomfortably with many citizens, the fact is when bullets and bombs start to fly your way those on the front line have more regard for their survival than concerns for what their mission has been labelled. The recent media reports about the training and the attitude of New Zealand forces deploying to Afghanistan raises a number of important issues. 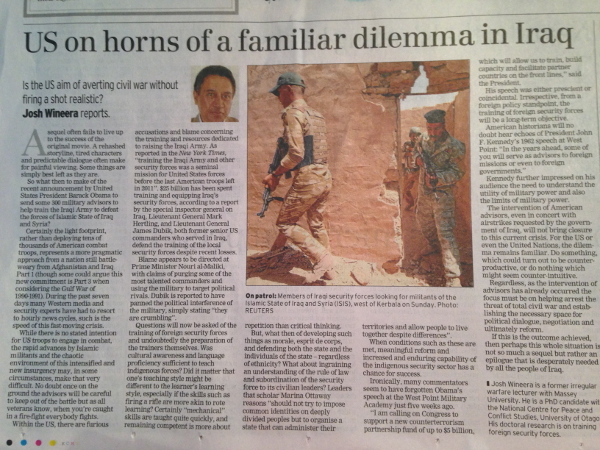 The fact that a soldier has raised concerns while observing the training of a contingent is actually a good thing. That is exactly the purpose of observing and making expert judgment on training for the contemporary warfare environment. No doubt there have been training concerns in the past and there will be more in the future. Some may have missed the point that such observations are designed to make the team better, not worse. The response so far has been to put the comments into a wider context of training for Afghanistan, and rightfully so. What will be interesting however, is to see if any follow up by the Defence Force focuses on the message or the messenger. Training in the military is a system. Those who present themselves for deployment are at the pinnacle of that system. The full suite of training courses and on the job experience they have previously undertaken is ultimately designed for them to deploy and succeed on operations. If things manifest as problems during the final training for operations it is sometimes difficult to recognise or even isolate where in the total system it may have gone astray. Attitude is acknowledged as affecting performance. A positive attitude tends to increase performance while a negative attitude can reduce it. Inextricably linked to attitude is confidence. Preparing for a military deployment requires confidence in those being deployed, confidence in the leadership of those deploying, confidence in those charged with providing the training and confidence in the training system itself. Accepting that war is imprecise, and more irregular these days, it is hardly surprising that the training and attitude for today’s military forces is under immense and constant pressure. Ideally, the force will depart for their mission confident that they are well prepared. To assume that they are ready for anything however, discounts the actuality of unpredictability. There is always a very fine line between sureness and an hubristic approach. Having a winning, positive attitude, and implicit trust and conviction in your comrades and the training you have received are what define the profession of arms. While it is good to hear that the training is going well, it is not always a bad thing to hear that it is not. Josh Wineera is a teaching fellow at Massey University’s Centre for Defence and Security Studies and is planning to teach a new 200-level paper “Irregular Warfare”in the second semester. Massey University lecturer and soldier Major Josh Wineera has been invited by the United States State Department to participate in a high-profile study programme examining US national security policy and current threats facing the United States. Major Wineera was chosen by the United States Embassy in Wellington as the sole New Zealand nomination from a very competitive national pool. He went on to be selected by the State Department in Washington from a range of worldwide candidates whose areas of expertise included foreign affairs and international relations. The intensive post-graduate level programme begins later this month in Amherst, Massachusetts, and brings together around 20 international participants. It includes study sessions at Harvard University as well as study tours to the University of California in San Diego and Washington D.C. The six-week programme will examine such issues as energy policy, economic stability, cyber-security, chemical and biological weapons, nuclear weapons and infectious diseases. The United States Government will meet all costs of the programme. Major Wineera says he feels humbled to be representing New Zealand, the Defence Force, and Massey University’s Centre for Defence and Security Studies. In addition to lecturing at Massey University, Major Wineera speaks to many Defence Force contingents preparing for overseas deployments, particularly to Afghanistan. His extensive operational experience includes missions to Bosnia, Bougainville, East Timor and more recently Iraq. He is also a member of the New Zealand forum of the Council for Security Cooperation in the Asia Pacific. And also covered in the Manawatu Standard. 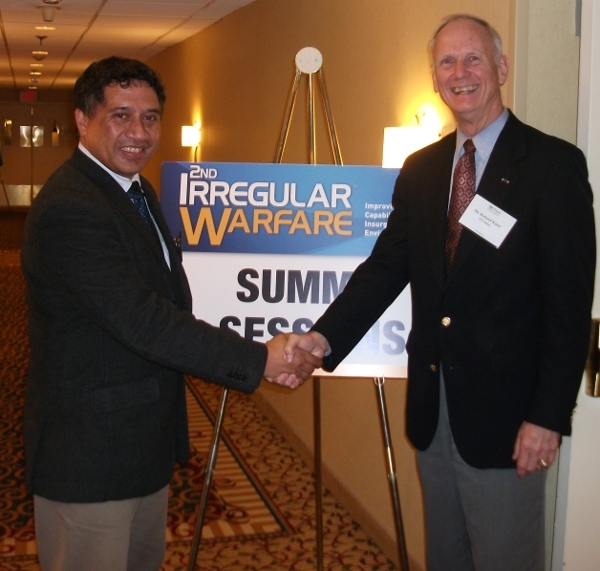 Josh and I attended the Irregular Warfare Summit is Washington last year to come up to speed on contemporary thinking on the irregular environment. It was a long way to go from the quiet (but windy) Manawatu and we weren’t too sure what we were getting ourselves into. I think that many of the other participants probably felt the same but once the ice was broken, engagement at all levels was frank and honest. There weren’t any great epiphanies for either of us and the main lesson that we brought home was probably that everyone is facing the same essential problems and that no one has the monopoly of solutions for the way ahead. 1. Bring a weapon. Preferably, bring at least two. Bring all of your friends who have weapons. Bring their friends who have weapons. 3. Only hits count. Close doesn’t count. The only thing worse than a miss is a slow miss. 4. If your shooting stance is good, you’re probably not moving fast enough, nor using cover correctly. 6. If you can choose what to bring to a gunfight, bring a big weapon and a friend with a big weapon. 7. In ten years nobody will remember the details of calibre, stance, or tactics. They will only remember who lived and who didn’t. 9. Accuracy is relative: most combat shooting is more dependent on “pucker factor” than the inherent accuracy of the weapon. 11. Someday someone may kill you with your own weapon, but they should have to beat you to death with it because it is empty. 12. In combat, there are no rules, always cheat; always win. The only unfair fight is the one you lose. 14. Have a back-up plan, because the first one won’t work. 15. Use cover or concealment as much as possible. The visible target should be in FRONT of YOUR weapon. 17. Don’t drop your guard. 19. Watch their hands. Hands kill. (In God we trust. Everyone else, keep your hands where I can see them). 23. Be polite. Be professional. But have a plan to kill everyone you meet. 24. Your number one Option for Personal Security is a lifelong commitment to avoidance, deterrence, and de-escalation. 3. Fly to target area, drop bombs, fly back. This article highlights the essential combat communication, mission orders,and the commander’s intent. It describes the means and methods by which a vertical-slice of commanders interpreted and analysed their orders; how they formulated and communicated their plan, and how the company commander monitored and adjusted the plan during its execution. The article is written primarily for junior leaders but also has utility for training staff, particularly practical lessons regarding the orders process. The importance of the battle-brief. There is merit in considering some sort of similar brief at the beginning of the orders. Everything else that follows would therefore be put in better context. In the age of high tech command and control systems, mud models still serve a purpose. Some of the quantitative data from the orders process however, could provide useful metrics for those charged with acquiring future command and control and decision-support tools. The threshold between higher conceptual military constructs and plainer, clear, mechanistic detail appears to occur at the platoon level. Offensive operations, that is close combat, still necessitates an infantry soldier to be prepared to ‘seek out and close with the enemy, to kill or capture him.’ These are ‘classic war-fighting skills’ and should not be degraded or regarded as obsolete. Warfare in the 21st Century entails kinetic and non-kinetic missions; they are not mutually exclusive. The challenge will be to try and create a training activity that simultaneously tests soldiers in the application of both missions, being reflective of the character of war as we know it today. 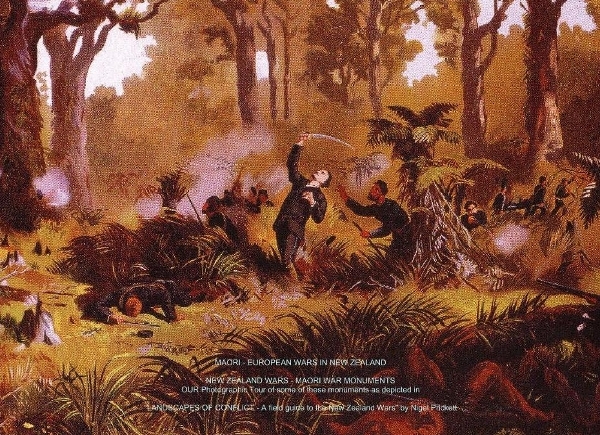 New Zealand’s recent assessment as the most peaceful country in the world reaffirms the relevance of offensive operation’s training – a reminder from Vegetius’s maxim “Let him who desires peace prepare for war”. The orders data captured from Exercise Absolute is but one source. This in itself would need to be validated against similar evaluations in order to confirm trends and recurring themes. Therefore, given the infrequency of combined-arms live-firing exercises it would be prudent to view all data and analysis in this article as an initial ‘yard-stick’. Why do email systems persist in placing the ‘delete’ button right alongside the ‘reply’ button?